Palliative Care Volunteers offer practical help and support for people with a life limiting illness and their families and carers. 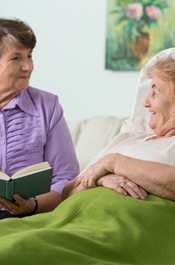 Volunteers are integral to Palliative Care Services. They bring a diverse mix of cultural and life experiences and expertise from the community, and are essential members of the interdisciplinary team. Each Community Palliative Care Service in the Hume Region has a Palliative Care Volunteer Coordinator and Volunteers that are trained to support clients with palliative care needs within the community and hospital setting. The organisations’ volunteers are guided by the Victorian Palliative Care Volunteer Standards (Victoria Department of Health and Human Services) and the Victorian Palliative Care Volunteering Strategy 2013 -2016 (Palliative Care Victoria). Volunteers are actively involved across a broad range of services related to direct client and carer support, community awareness and promotion and fundraising amongst other activities. Each agency undertakes volunteer recruitment, orientation, training as well as ongoing education and support. If you are considering volunteering in the community and would like further information about volunteering in palliative care please contact a Community Palliative Care Service nearest you.